Two weeks ago, we sued the Trump administration over its decision to separate a Dreamer from his loving husband. Marco Villada is a DACA recipient who grew up in California and knows no other place as home. In 2014, he married the love of his life, Israel Serrato, and they built a vibrant life together. Despite following all the rules for adjusting Marco’s status to lawful permanent residence, Marco and Israel have been unjustly separated from each other by a consular official’s mistaken decision. Marco is currently blocked from coming home to Los Angeles. He went to Mexico to finish the process of obtaining a visa through his marriage to Israel, trusting the adjustment process and fully believing he would be able to return. Despite assurances by immigration officials that Marco would be allowed back into the U.S., U.S. consular officials in Juarez barred him from returning. As he has with many Dreamers, President Trump failed Marco when he cruelly terminated the DACA program. Congress failed Marco again by failing to pass the Dream Act. 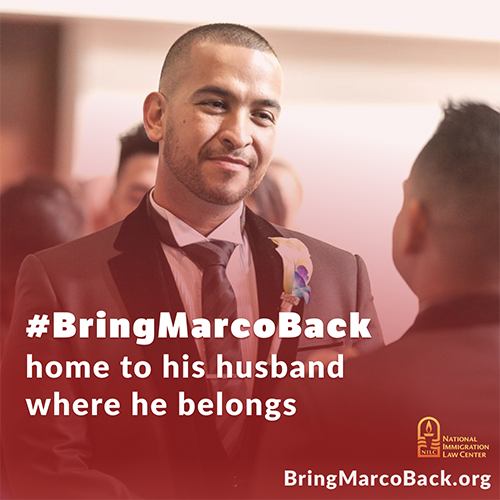 Now, finally, the Trump administration has failed Marco yet again by barring him from coming home and thus separating him from his husband, family, friends, and life here in the U.S.
Sign the petition urging President Trump and his administration to stop hurting Dreamers and #BringMarcoBack. After you sign the petition, spread the word! Share the petition and the video with your friends on Twitter and Facebook. – Write your senators and representative a letter telling them about Marco and Israel and asking them to talk about this injustice on social media, in floor speeches, and with their colleagues. – Call your senators and representative in Congress, share Marco’s story, and ask them to make sure all Dreamers are protected. Call 202-224-3121 and tell them to pass the Dream Act now. – Tweet at your senators and representative! Share Marco’s story with them on social media via Twitter and Facebook. We hope you will join us in demanding justice for Marco and Israel. Thank you for lifting your voice and spreading the word to help us #BringMarcoBack. This entry was posted in Uncategorized on April 23, 2018 by Richard Irwin.